OS grid reference: SD 8424 4768. 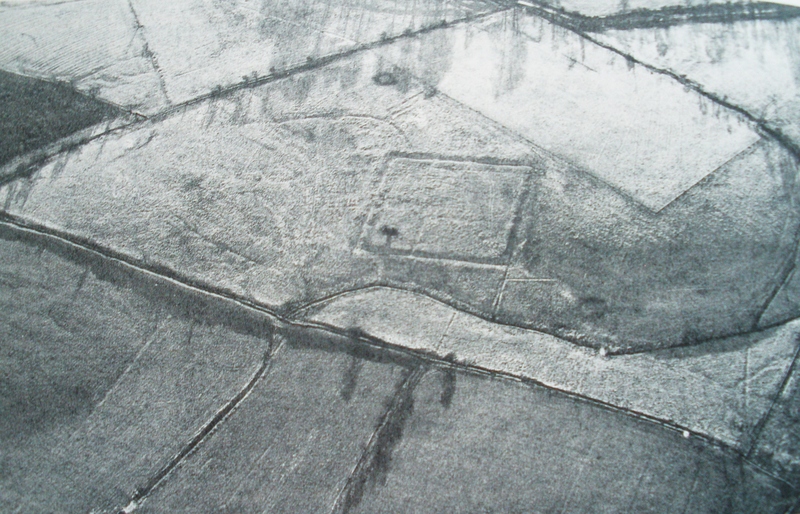 The rectangular-shaped earthworks known as Bomber Camp are to be found in a field just off Coal Pit Lane, about 1 mile south of Gisburn and half a mile east of the A682. You can quite easily make out the earthwork ditch and low banks at ground level, but they are best seen from high above with an aerial view of the area. 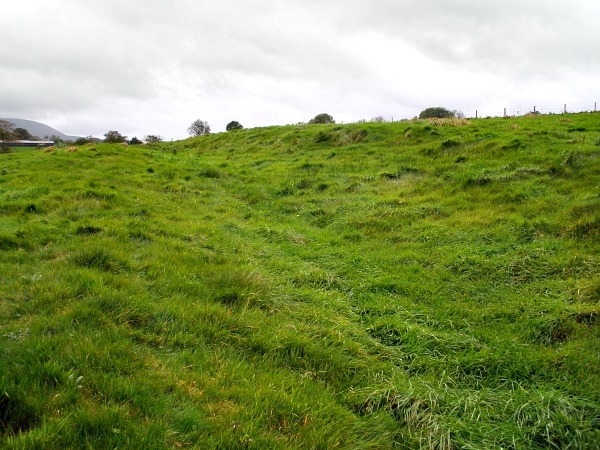 These earthworks are all that remain of a Romano-British camp, villa or settlement, dating from the mid to late 4th century AD, that is situated on a low hillside. Roughly the earthworks measure 200 feet by 220 feet – about 1 acre. 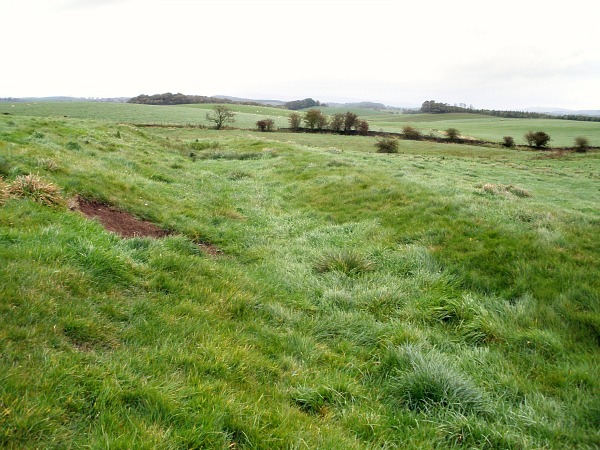 There is a ditch running around the edges of the site with an entrance at the south-eastern side. Some post holes were found during excavations here in 1940. The excavations also discovered cobbled and paved surfaces inside the camp’s enclosure. A number of artifacts were found including a sword, a quern stone, mortaria and some Samian-ware that was typically 4th century in date; and other pottery called grey-ware. Some of the pottery fragments had traces of burning – although no hearth was found. In the 1970s another archaeological dig was carried out here, but no report compiled. Bomber Camp, Gisburn (An Aerial View). It seems that Bomber Camp may have been a mid-4th century Romano-British settlement or farmstead, but there is evidence to say that it was, in actual fact, a villa belonging to a chieftain because of the post-holes that were discovered here. In about 365-370 the camp or settlement was burnt to the ground as civil unrest began to spread across the north of England, perhaps even outright and violent warfare between retreating Roman forces and local tribes. Another smaller earthwork at Primrose Hill, just to the south-east, close by Hesketh farm most probably dates from the same period as Bomber Camp. [I am indebted to John Dixon & Philip Dixon whose brilliant book ‘Journeys Through Brigantia Vol 1 Walks in Craven, Airedale and Wharfedale’ by Aussteiger Press, Barnoldswick, 1990, which I have sourced here for some of the information. Thank you]. Bomber Camp, Gisburn, Lancashire (looking west). 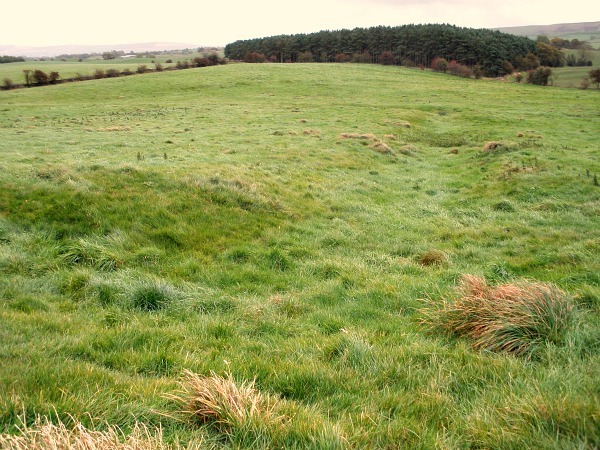 Categories: Bomber Camp, Romano-British Site | Tags: Bomber Camp near Gisburn in Lancashire, Earthworks | Permalink.